How is it possible ? Pick up one of our new 25-coin boxes for $75. Spend the coins around town, give a few as gifts to out-of-town friends; if you’re a merchant, offer them as change to your customers. Then give the empty coin box to the non-profit of your choice. Coastal Marin Fund redeems boxes from non-profits at $40 each. Designed by Bolinas wildlife artist Keith Hansen, these solid brass coins, worth $3.00 each, can be used at participating businesses throughout West Marin. 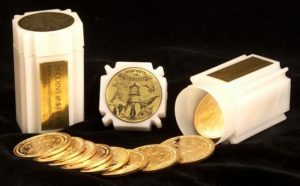 The coin is engraved with local icons: the Point Reyes Lighthouse, Tule elk, an osprey with the pens and brushes of the community’s writers and artists in its talons, the bounty of coastal Marin’s farms and ranches, its wild beaches, the heritage of native people symbolized by the arrowhead, its ridgelines and abundant wildlife. There are no grant applications or awards committees. You decide who gets the $40 contribution. And you can do this over and over again. So the next time some credit card purveyor or other enterprise tries to wow you with a promise to donate 1% of your purchases to a charity, think 56%. Because that’s the percentage that goes to charity with our local coins! Box of 25 $3 coins provides $75 to CMF. Of the $75, $25 is set aside to mint new coins at approximately $1.00 each. Of the remaining $50, $40 is paid out to local non-profits. The remaining $10 is set aside for CMF administrative expenses if needed.